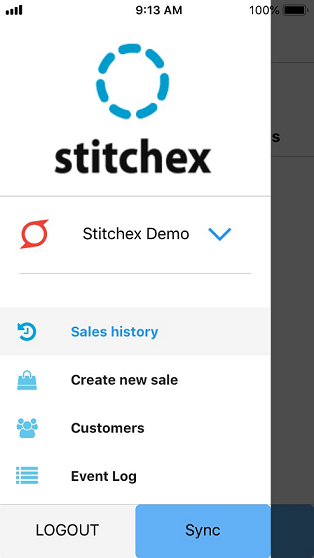 The first time you launch your new Stitchex Mobile App you will be taken directly to the Sales Order screen. However, if you want to go to any other part of the Stitchex Mobile App, simply click on the menu bars in the top left of any screen. If you manage more than one Stitchex company, you can click on the blue down arrow on the right to select from a drop down which company you want to manage. To look at the history of Sales that you have started but not submitted, you will find these on the Sales History log. If you want to create a new Sales Order for one of your customers, select. If you want to add, view or remove your Customers, select "Customers" from the main menu. If you want to look at events that have occurred on your account, select "Event Log". If you want to Sync your Mobile device with your full Stitchex systems, click the Sync button. For more information about any of these functions, please see the function specific module Knowledge Articles for Mobile Apps.